Years ago I attended a reading for the poet Charlotte Mandel. That was the first time I'd met her or heard her read. I was at the beginning of my own writing of poetry. Charlotte was in the midst of her long career as poet and publisher. After that first meeting, we met over the years at other poetry events as we're both NJ poets and lived close to each other. Since then, she has moved to the same town I live in and we often attend events together. It is my great pleasure to now call her my friend. 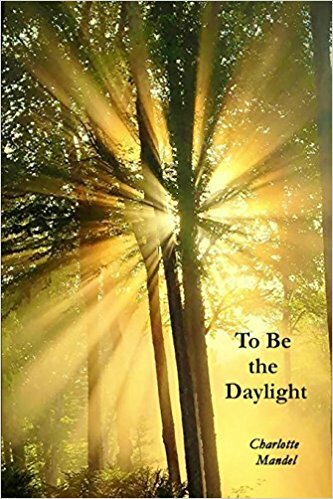 Yesterday I attended a book party for Charlotte's latest book, To Be the Daylight, her tenth collection, a book I was happy to blurb. The reading was held at our local library and was well attended by relatives, people who live in Charlotte's residential complex, students from the local university, and old friends. We all enjoyed a wonderful reading as Charlotte read both form poems and free verse ones—she is equally adept at both. Here's one of the poems she read, a favorite of mine from her book and which I was proud to first publish in my craft book, The Crafty Poet II: A Portable Workshop. The form is called Rimas Dissolutas. See if you can figure out its rules. can vary by seconds, minutes and hours. Physicists surf waves on cosmic oceans. set off this wild yo-yo we call sublime? of drought-shriveled fruits, earthquake implosion. the beauty of your body/soul's creation. I took some pictures and hope they will give you a sense of the reading. from Caldwell University and was interviewed by them. This was a lovely day and a wonderful reading. It was a privilege and a pleasure to be in the audience. What a fitting and lovely tribute to Charlotte. It really was a delightful Poetry Reading and I'm thrilled that the Library was able to host the event and support local poets and poetry writing. It was also quite exciting to see the students from Caldwell University interviewing Charlotte. Definitely a cross-generational learning experience!